Games critique is hard. A well-written review requires expert writing and analysis, sharp focus, great organizational skills, and a thorough understanding of your own writing and opinions. Few writers can achieve all these things, myself included. The reason I’m writing this is because a popular YouTuber named VideoGameDunkey recently published a video titled “Game Critics.” The video is a scalding critique of the way large gaming outlets like IGN or Gamespot review games and how unrefined he finds those outlets’ critique to be. I do recommend you watch the video, as some of the issues he discusses in this video will be talked about here. However, to avoid losing focus I’m sticking to the topic of this story. If you want a good hot take, my man Philip Kollar from Polygon sums up the negatives and positives of the video pretty well on Twitter. Additionally, Waypoint’s podcast touched on the subject fairly well if you would rather listen than read. Now, I am not the greatest of writers when it comes to critique. In the past two years of writing reviews, I’ve had my ups and downs. Nevertheless, I do understand that knowledge and execution are two very different things. I am also aware an article like this is wholly subjective and my advice may differ from that of other critics. Most important of all, this is about written reviews rather than video reviews which differ greatly in length and content, so many of my points won’t apply to critics making video reviews. Right off the bat, what I’ve showed off there is my ability to understand my own strengths and weaknesses in my writing. This is one of the most important aspects when it comes to connecting with the person reading your review. You need to understand your own opinion when writing a review, otherwise you cannot understand and explain why you dislike or like something. Say you have a huge bias against puzzle games (as I do); you just hate them. Suddenly, you’re writing a review for The Witness and give it a horrible review. Everyone’s confused, angry, shocked, all because you decided to give the game a 4/10 review, but failed to explain why you disliked it so much. When you admit your issues and biases, you can not only work around those issues to explain why you don’t like a game, your reader can better understand how their preferences might make the game more enjoyable for them compared to you. Additionally, if you dislike puzzle games, but give Portal 2 a 10/10, your reader can say “wow this must be a genuinely good game.” You’re not a robot, there’s no reason to act like you’re a robot writing a review. You can speak to the reader directly and let them have a better understanding of who is writing said review. Another important point you probably didn’t notice just then, skipping over the disclaimer video, the first subject I talked about was also the last one I mentioned in the lede. This is what I’m talking about when it comes to organizational skills. What I’ve done there is exploit the “primacy effect” or rather the “recency effect” which means your mind will best react to the most recent subject mentioned. When you’re organizing a review, not only should you be thinking about how the reader will receive information, that info should be organized from most to least important information, making sure the major successes or flaws of a game dominate your critique, instead of spending several paragraphs nitpicking over egregious micro-transactions. Side-note, you really should call out micro-transactions whenever you can, they’re a plague on consumerism. You also need to figure out what the reader wants to hear from your review, and make sure that takes center stage. Many readers simply don’t have time or patience to read a whole review, so you need to make sure the important info comes across as soon as possible. This means it is important to organize the most important info towards the start. 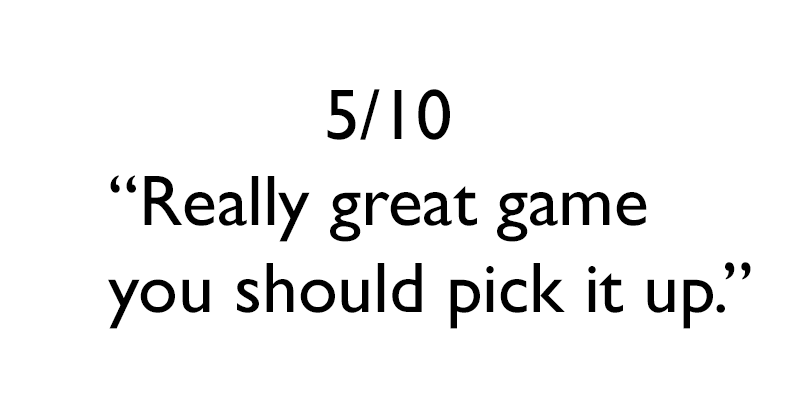 Many sites, TAY included, have review cards so readers can jump straight to the end and know what a critic thought about the game without doing much reading. This also applies to the focus of your reviews. You have to understand what is important in your critique. If your review does not focus on what makes the game truly good or bad, you may be compromising the quality of your review. One of the best examples of a lack of focus in a review can be shown between two Polygon reviews. Both reviews have the same issues with two different games, but only one review maintains proper focus on the bigger issues and positives of the games. That would be Polygon’s infamous review of Bayonetta 2 and its lesser known review of Dragon’s Crown. Note: My source for having found these two reviews are from an editorial by veteran games critic TotalBiscuit, which I highly suggest you watch. Its important to note that when Polygon reviews a game, the writer of the review meets with editors before determining the review score together. It is also important to note review scores are entirely arbitrary and have little to no real meaning. The review for Bayonetta 2 gave the game a 7.5 out of 10, which many found way too low considering his review was mostly glowing, save for one issue. He found the game to be almost puerile in its use of sexual characters and how the game, despite its supposedly fantastic gameplay, visuals and story, was somehow ruined by it. Moving onto Dragon’s Crown, which was given a 6.5. The review praises the stylized visuals and initial reaction to gameplay, but bashes the grind of the gameplay on top of its oversexualization of the female characters. Source: Polygon’s review of Dragon’s Crown. The Bayonetta 2 review made the opinion of the writer null in the eyes of many readers as they only saw a man who can’t stop focusing on one issue most would see as minor, if they saw it as an issue at all. On the other hand, the Dragon’s crown review was a balanced critique of the gameplay on top of juvenile character design. If you are incapable of seeing the big picture and focusing only what matters rather than drawing attention to a single issue, you keep your review from being dominated by a single, possibly controversial opinion. You have to make sure your readers understand your main points without distracting them with non-sequiturs and meaningless language. Speaking of non-sequiturs and meaningless language, the one part of this article many writers will struggle the most with: your own ability to execute proper writing skills and intelligent analysis. Firstly, most of writing is trial and error. Over years of writing you will notice your writing go from simplistic and full of poorly explained points to being complex (but understandable) and full of astute observations from your time with a game. I’ve been writing about video games on TAY for two years now, and in that time my writing has changed dramatically for the better. Then again, working on an English degree might have contributed to that as well. The few things I can teach you that won’t be learned through personal experience aren’t exactly lessons in game critique, but rather basic writing skills which apply well to games critique. Your writing should be thorough, but succinct. Just because you can say “I didn’t like the gameplay” in just one short sentence, doesn’t mean you should. You need to explain the nuances of what made you struggle with the gameplay. Was it the controls? Maybe the camera stuck too close to the player, making it hard to see? Just then I’ve made two points which could be damning for most games. Nevertheless you don’t need to write long, drawn out sentences about your personal experiences. In other formats like video reviews you can just show an issue with the game, but explaining your full experience can waste time and artificially lengthen your review without adding much useful information. There is a sweet spot in between writing too much and writing too little; try and hit that sweet spot. A very important issue with many high-profile reviews today is the lack of substance. If you watched Dunkey’s video above, you would have heard the “makes you feel like Batman” joke. This is a major issue lots of hastily-written reviews have, where little to no actual analysis occurs. At no point should someone have to ask “what does that even mean?” when reading your review. If you’re going to write something, make sure its clear as to what you’re saying. Rather than wasting your readers time saying “This game makes you feel like Batman,” you could have said “the detective work and satisfying combat in this game make for an immersive experience.” Those two quotes mean the exact same thing, but the second quote actually has substance. One of the most important parts of good analysis is maintaining a mix of subjectivity and objectivity. As I said for understanding your own taste in games, you’re not a robot, so you can make your own opinion clear to the reader. Most of all, many new writers don’t realize a review shouldn’t be written the same way a high school or college essay is written. A level of refinement in your speech goes a long way, but injecting your own voice and using the first person in your review is totally okay and won’t compromise the quality of the review if you write well. Little else can be said, but if you think I missed anything vital or want to add some of your own sage advice, please do so in the comments below. You’re only contributing to better games critique online!